I’ve has this vision of molasses buttercream floating around my head ever since Heather came to town. 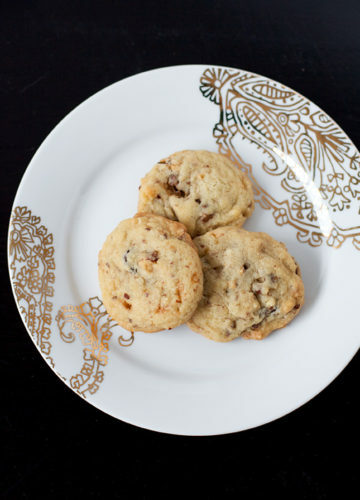 She brought some delightful espresso macarons to her book signing this past summer, filled with a surprising molasses buttercream. I first attempted to re-work the bourbon layer cake, intending to use it as a base for this inspired buttercream, and also playing with the recipe as it has never completely satisfied me in terms of consistency. Unfortunately, my modifications, which I thought would help make the cake lighter and fluffier, only made things worse. With another cake failure settled into the garbage and me not wanting to give up just yet, I still needed a vehicle for my molasses buttercream. So I turned to my faithful stand-by: Sky High: Irresistible Triple-Layer Cakes. In it was a recipe for a delightful sweet potato cake. Seeing as how we’ve been getting a steady 2 pounds of sweet potatoes each week with our CSA and a whopping 10 pounds this past week, I had no shortage of sweet potatoes. It seemed it was meant to be. While it isn’t the simplest cake to prepare, the extra step of whipping and folding in the egg whites make the cake light, with a delicate crumb that most sweet potato or pumpkin cakes lack. In fact, I may have to try this trick on the aforementioned bourbon cake as it could definitely use some lightening up. The cake itself has a very light sweet potato flavor and subtle spiced undertones. It’s like a milder version of pumpkin pie, only with sweet potato, and cake instead of custard (ok, so maybe it’s not like pumpkin pie at all). But my intuition that it would be delightful in combination with a sweet and sticky molasses buttercream? Spot on. I’ve slowly realized, over the years of making cakes and cupcakes, that buttercream has distinct seasons (and I’m talking about straight up American buttercream here, don’t even get me started on the meringues and other varieties). Summer means soupy buttercream, so you better have some shortening handy. Spring and fall are ideal for buttercream-preparation, where the temperature of “room-temperature” is, apparently, perfect. But I never thought I’d have trouble with winter buttercream, even more so than the pesky summer stuff. It definitely requires some more experimentation on my part to figure it out, but I assume that the butter is simply too cold. Even at room temperature it’s still a chilly 65 degrees. My winter buttercream often stays thick, bordering on buttery/greasy in texture (even though the powdered sugar makes it plenty sweet). Adding more milk/cream to lighten it up only works to a certain extent, after which adding more doesn’t change things one bit. Poor, sad, moody buttercream. Guess you can add American buttercream to the ever-growing list of seemingly-simple things with which I constantly battle (including, but not limited to: chocolate, chocolate ganache, chocolate candy coating, caramel, and pie crust). Perfectly fluffy or not, luckily, it still makes for a fantastic cake. Preheat oven to 400 degrees F. Prick sweet potatoes in a few spots with a fork, then place on a foil-lined baking sheet and bake for about 1 hour, or until the potatoes are very soft and beginning to caramelize. Remove from oven cool slightly. Reduce the oven temperature to 350 degrees F. Butter the bottoms and sides of three 9-inch round cake pans. Line with parchment paper; butter parchment. 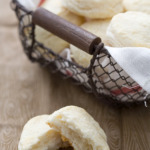 To prepare frosting, in a large mixing bowl, beat butter on medium-high speed until smooth and fluffy, 2 to 3 minutes. Add powdered sugar, 1/2 cup at a time, mixing well after each addition. Add molasses and beat until incorporated. Depending on the temperature and consistency of your frosting at this point, add milk or cream, 1 tablespoon at a time as needed, then continue beating until frosting is light and fluffy. To assemble, level each cake layer by cutting of the domed top with a long serrated knife. Place one layer, flat side down, on a cake stand or serving platter. Spread on a layer of buttercream using an offset spatula. Position second layer on top and press to adhere. Repeat with another layer of buttercream, and then position final cake layer, flat side up. Remove cake from refrigerator and frost with remaining buttercream, reserving some for piping decorative details if desired. Cake base adapted from Sky High: Irresistible Triple-Layer Cakes. Hi. Just wanted to say that the top picture? So good it kills me. So good. This look A-M-A-Z-I-N-G! I’m really curious to know how it tastes. And, by the way, the top picture could be the cover of a cookbook: it’s fantastic! I agree! I am so impressed with how straight the cake layes AND the icing layers are! Sweet potato is cake? I’m sold when it’s topped with that buttercream! Wow! This sounds so interesting! 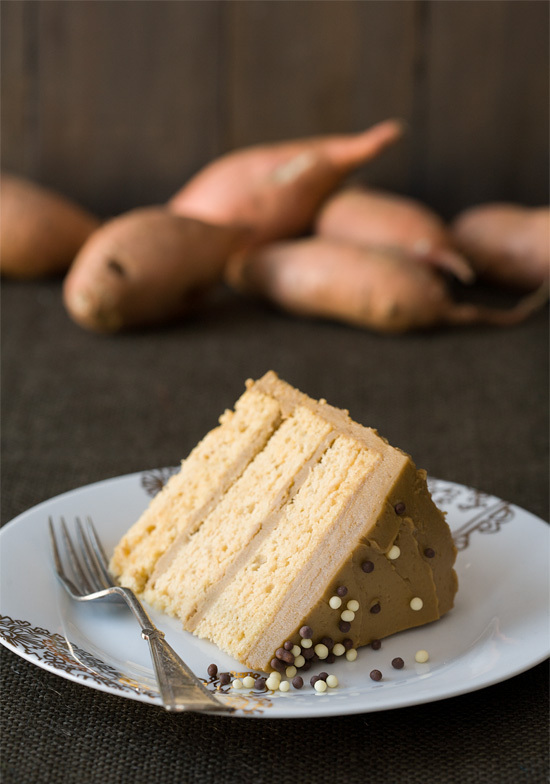 I never would have thought to put sweet potato in a cake! The pictures in this post are just stunning, like take your breath away stunning. 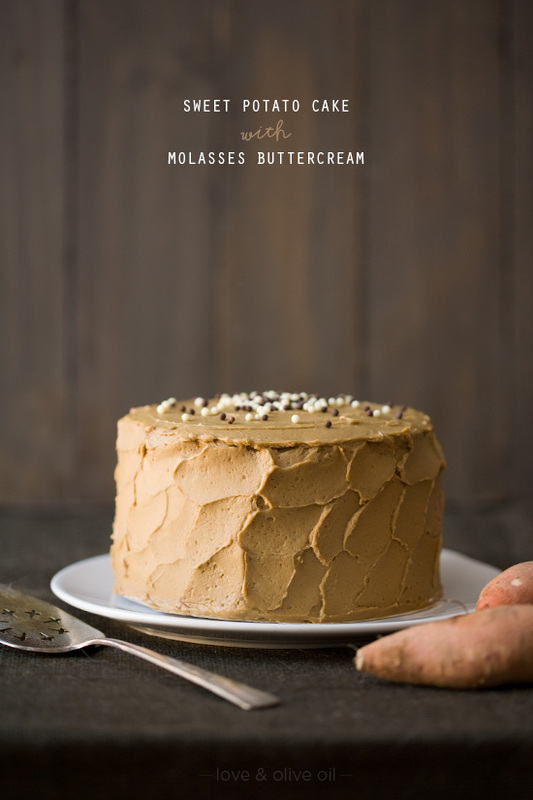 And that molasses buttercream may be what I’m dreaming about tonight! This looks so amazing!! You should definitely start selling these if you don’t already. Gorgeous! What a beautiful cake!! 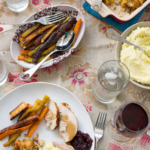 I love that you used sweet potatoes! What a stunning cake and so perfect for the holiday season. I love the cover photo – breathtaking! Absolutely gorgeous! I can only imagine how this tastes… my mouth is beginning to water. Just beautiful! 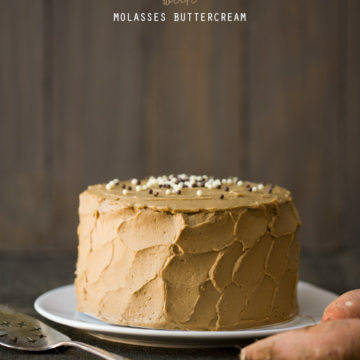 Molasses buttercream!? Amazing idea. I was planning on making a sweet potato cake with maple cream cheese frosting but now I am torn. This cake looks seriously perfect! WOW, you take the most amazing photos… that cake looks phenomenal! 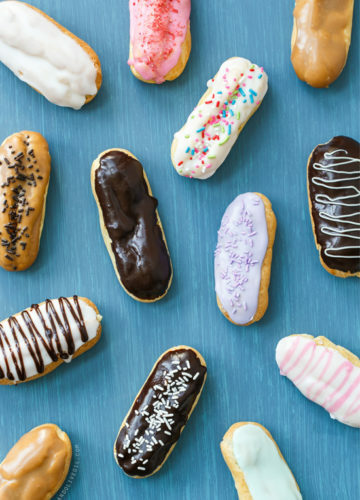 What are those sprinkles/ decorations made out of, chocolate? THIS MADE ME GO TO THE KITCHEN AND GRAB A KINDER SURPRISE EGG BECAUSE I NEEDED SUGAR NOW! :D Wow, what a cake! This sounds so delicious! I just love the idea of molasses buttercream. This is just sinful…and amazing and exciting and delightful and I can’t wait to try it! Looks amazing! Could you substiture rice or almond flour for the cake flour? This cake sounds so different and amazing! I don’t think I’ve ever used molasses in a frosting of any kind (I say, as though I’m making cakes right and left–I’m totally a twice-a-year cake baker), and it sounds perfect with sweet potato cake! OMG, I don’t even know what to say besides slice me up a piece now. Sweet potatoes in the cake!? LOVE this! It looks beautiful – so light and soft – I finally found sweet potatoes where I live and have been excited to put them in everything. This is next on the list – amazing. Taking a bath in molasses buttercream is totally acceptable, right? I love the flavors you have combined for this cake, and the photo is out of this world. Kinda wish I had a slice of that right now. I dont even know where to begin!! The sweet potato cake itself, it looks so moist and rich and fab. Then I LOVE molasses and I love….frosting! I don’t need cake, I could just have frosting and this is frosting I want! This is look F***ING AMAZING. I really don’t know how else to say this. I love molasses. My new breakfast is “gingerbread oatmeal” with molasses mixed in. This cake looks so good, my sister who does a gluten-free baking blog (http://cakesnbakes.wordpress.com/) just told me she is thinking of doing a GF conversion on this recipe. P.S. — Love that you are fellow designers, this blog is fantastic. I was expecting the cake to look dense and darker in color, but it looks so light. I bet it is such a great compliment to the buttercream. That is one gorgeous cake! I love the way you frosted it, too. The flavors sound perfect together. Whoa, that is a lot of sweet potatoes! This cake is absolutely gorgeous! I love how light and fluffy it looks, as these types of cakes tend to be dense. Love, love, love! Your pictures are absolutely incredible!! Not only a gorgeous cake, but absolutely perfect for the season! I LOVE your blog! What an amazing idea and layer cake! Great job on the layers, evenness, and beautiful butter cream. I’m obsessed with new and unique ways to use Sweet Potatoes and this definitely fits the bill! 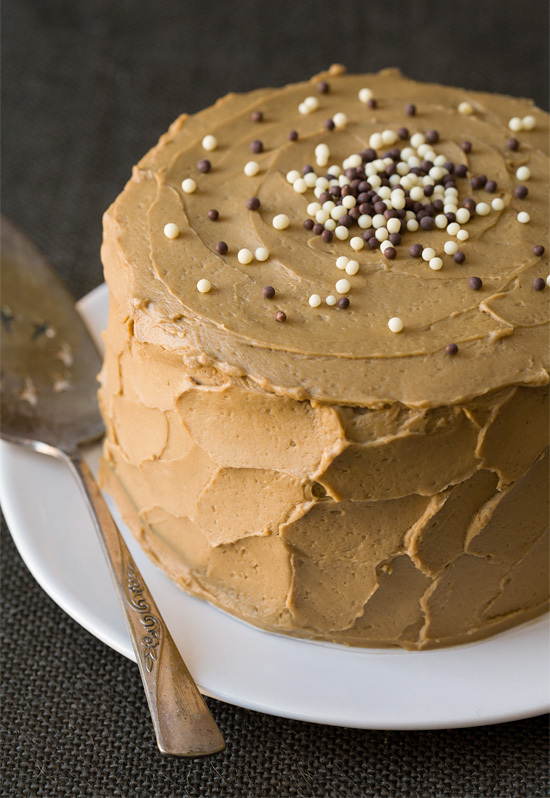 This looks great, especially with the molasses buttercream frosting. Yum. I will have to try it at a holiday party sometime soon! That looks super delicious anything with sweet potatoes would be good! 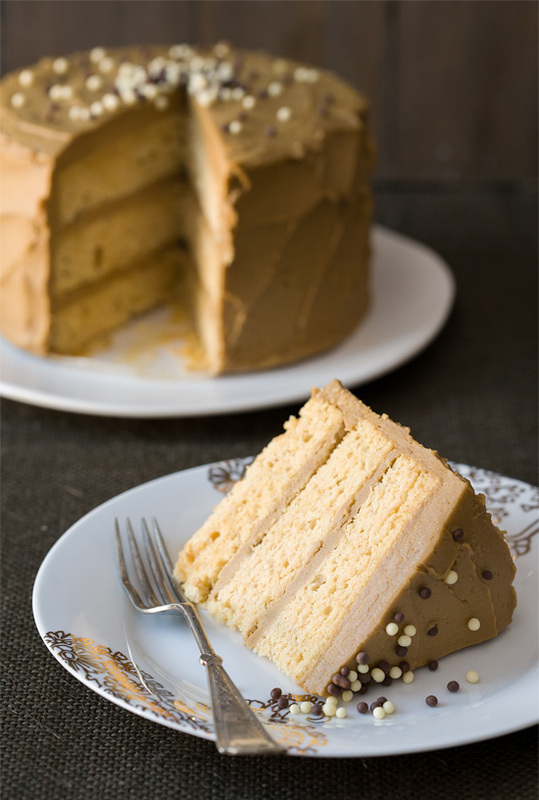 yum, this looks great :) I like the idea of sweet potato cake with molasses buttercream. Delicious combo! Thanks for the wonderful recipe. Just made this cake for a potluck and everyone loved it! I used the original recipe without the amount for vanilla listed but 1 tsp seemed to do fine. Definitely recommend using the butter at room temperature. Tip: I baked the sweet potato the day before and saved the puree in the fridge for the next day. Still took me over 3 hours but it tasted amazing! My sister and i made this cake and it was fantastic!! the cake tastes like pumpkin and the buttecream icing was delicious. Im in love! This cake was so moist and wonderful! I doubled the amount of molasses in the buttercream. I love molasses and I have a cold, so Im pretty sure that my tastes buds are off, but It worked out and made a wonderful frosting. I made this cake, for my birthday, to share with our little family and our neighbours. It was very very good. Thank you for the recipe. I just finished making the lemon chocolate cake, for our children’s Easter Sunday breakfast (yup). I hope it gets the thumbs up! This is the first cake I made not from a mix and first buttercream I made! Turned out great and my husband loves it, So glad I found it, thanks for putting it up! 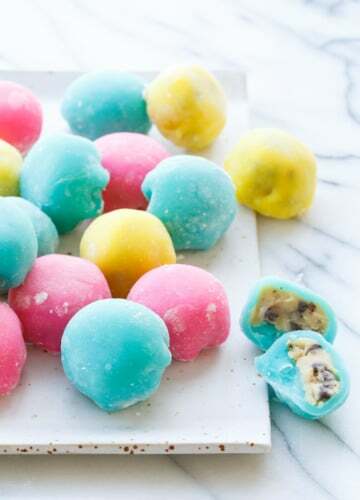 I came across this on Pinterest today, and just wanted to pop in and let you know that this recipe sounds incredible! The flavor combination is so fitting for this time of year, and a welcome change from the typical apple and pumpkin varieties. I made this cake yesterday, and I think it’s my new favorite cake! Distinct flavors, moist, and sweet without being overbearingly sweet. I’m new to making from-scratch cake, so it took me a long time, but it came out perfect. That being said, I would wait until you have the rest of the batter ready before fluffing up the egg whites. Mine were just starting to recombine into liquid whites by the time I incorporated them into the batter. Also, I didn’t need any extra milk/cream in my frosting. Fall really is the best season for buttercream! Thanks for the recipe! HeyLindsay, is it sweet potatoes (the tuber w white insides but sweet tasting) or is it yams (the tuber w orange insides)? I know yams and sweet potatoes are usually used synonymously but I don’t want to get it wrong. :-P Thanks!!! Orange ones. 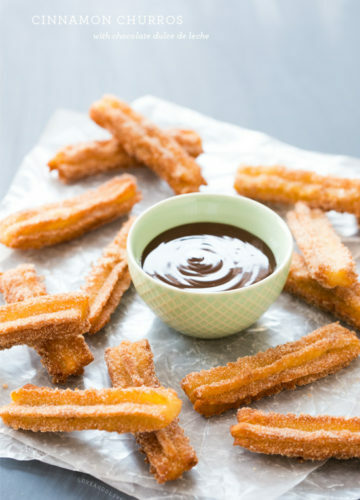 :) You can also use canned puree. Did you bake two recipes of the cake? I’m noticing you have 3 even layers. At first, I thought you cut the two in half but, when I went back to see the picture, there are only 3 layers, not 4. Please clarify. Thanks! Just divide the batter among 3 cake pans. :) Easier than baking the cakes and trying to split them later. I made this for Thanksgiving. It went over phenomenally! That Sky High book is the greatest, your frosting recipe was grand! Cheers! I baked this cake yesterday in preparation for a colleague’s retirement party today. It was a knock-out and nearly every slice was gobbled down happily, with a glutinous pride! I found your recipe via Pinterest several months ago and only ventured down the path of making it for the first time yesterday. I will surely return to this recipe again and again. What an excellent suggestion for molasses butter cream. It was the perfect pairing with this cake. THANK YOU! Do you think substituting boiled apple cider would work in place of the molasses? You mean like boiled down until it was thick and syrupy? I think so, as the molasses is mainly a flavoring agent in the frosting. As long as the consistency of the boiled cider was comparable to molasses, if you preferred the flavor of it I think it would work fine. If it is thinner though just be careful not to add too much or it might affect the consistency of the frosting. Is there any way to make this dairy-free? I just bought the ingredients for this to make on thanksgiving. I haven’t been able to stop thinking about this cake. I have never really found much interest in bakimg , but I am totally excited for this try…maybe it will change my mind. hi i just wanted to let you know that ive been thinking about making this cake for probably two months! i JUST got all the ingredients, except the sweet potatoes, about a month ago. whats stopping me from making it, then? the sprinkles! i know i can decorate it any way i want, but i want it to try to look as close to the real thing as possible (its just so pretty! !, can you blame me?) lol. These sprinkles came from Trader Joe’s a few years back… and not something they carry anymore unfortunately. HOWEVER I have seen things called ‘crispy pearls’ that are basically little pearls of crispy chocolate. They come in both white and dark, I believe. A quick google search brings up a number of sources! They may be a bit bigger than the sprinkles I used but I think they’d have the same effect. i discovered this recipe over two years ago and have made it three times since. This is one hell of a cake. Truly decadent in the nicest of ways, a revival of homespun flavor, a renaissance of richer fall hues that truly satisfy the palate. I made this for coworkers the first time I prepared it, and it was a knockout. Second time for family and they raved as they patted their too-full bellies. I’ve also adopted your molasses buttercream as THE frosting of choice, no matter the cake or cupcake. For my son’s 2nd birthday, I made yellow cupcakes with the molasses buttercream. I prepped subtle Mickey Mouse face/ear shapes out of melted milk chocolate and placed one atop each mound of molasses buttercream. Parents were in love, and the children were smitten. Thank you for this truly unique recipe that I’ve come to rely upon. I’ve added it to my collection of recipes to pass down to my son. How special to share mama’s modern finds on Pinterest in 50 years when my son is nostalgic for a taste of home. Would it be possible to adapt to cupcakes? I first made this cake about three years ago and it has been a fall staple for me ever since! It’s full of flavor and not overly sweet, and folding in beaten egg whites gives it a fluffiness you just don’t find in similar vegetable-based cakes. I have made two main changes to the recipe. First, to cut an hour off the prep time, I use canned yams. Do NOT use candied yams, just canned yams. Try to find them in the lightest syrup possible, and rinse them before use. I’ve found that it doesn’t significantly change the taste, but it does significantly change how long it takes to make the cake. Second, the recipe says to beat the egg whites before mixing the other ingredients. If you are faster/less easily distracted than I am, that’s fine. I, however, prefer to mix everything else and beat the egg whites last. That way I don’t risk losing air out of the egg whites before I fold them into the batter. On the whole, this is a fantastic recipe that always gets very positive reviews. It will probably be part of my baking repertoire forever. Thanks! Making the cake exactly how you made it, how much leftover frosting is there? I hate when there’s leftover frosting and when recipes don’t give you a heads up lol.. please response ASAP, it’s in the oven now! Sorry your cake didn’t turn out. By nature a sweet potato cake is going to be denser than, say, a plain yellow cake if that’s what you are comparing it to, but in my experience it was still delicious. A number of others have made it without issue as well. There are a number of reasons why a cake might turn out too dense. Was it maybe underbaked? Or could your baking powder have been expired, perhaps? This looks delicious!! Do you know if it would work with oat or almond milk instead of the whole milk?